If you’re looking for the ultimate summers day out, then the popular town of Betws-y-Coed has plenty to offer. Steve Goodier reports. Betws-y-Coed is Snowdonia’s Alpine village. For mountain lovers who have visited the world’s greater ranges, this is as close as we come in our islands to something that would not be out of place near Chamonix or Courmayeur. I have spent many days and nights in the village and nearly always stop there on my way home if I have been on the mountains around The Ogwen Valley or on The Snowdon Range. From light summer evenings (when the cafés are still open) to freezing dark winter nights (when we have halted for chips and fish) – the place holds many memories for me including one particularly wonderful Boxing Night party at the house of a friend who used to live there – but that’s a story for another time! Betws-y-Coed is understandably North Wales’ most visited inland resort with not only walkers, climbers and mountain bikers to be found on its streets, but also general sightseers and tourists who arrive by car and often by coach. It is a happy, bright place which is busy even on dull days and is often packed on wet afternoons when the outdoor lovers forsake the hills and soggy crags and head for the cafés and shops to dry off and spend some money. Geographically Betws-y-Coed falls within The Snowdonia National Park and lies in a delightful and densely wooded valley close to the high mountains. The village has developed around the old coaching highway (which is now The A5) that runs through the middle of it as Holyhead Road. When most people think of ‘Betws’ water springs to mind, initially the nearby and much loved Swallow Falls (considered by many to be the prettiest spot in North Wales) with all its associated legends – but also because The River Conwy meets its three tributaries here too – The Rivers Llugwy, Lledr and Machno flow in from the west and add to the charm of the location with deep mysterious pools, fast flowing rapids and tumbling waterfalls. Ancient bridges span the flowing water with the most famous of these being The Miners Bridge (where miners crossed the river on a steep ladder bridge on their way to work) and Pont-y-Pair Bridge (The Bridge of the Cauldron) where locals and visitors alike gather on sunny autumn days to see if they spot salmon leaping up the rocky falls here. Occasionally swimmers brave the deep pools but most are content to just sit with an ice cream or a drink and take in this enchanting scene. Waterloo Bridge was built in 1815 (the year The Battle of Waterloo was fought) by Thomas Telford and now carries The A5 over The River Conwy. Telford’s bridge brought much in the way of coach transport and the village became a Victorian favourite with artists flocking here in numbers and tourist figures rising as a result. Betws-y-Coed became the premier coaching stop between Corwen to the east and Capel Curig to the west and a regular halt for the mail coaches and wealthier tourists headed for Ireland as they travelled between London and Holyhead. The locations popularity also saw a fast improvement too of the road north to Llanrwst and Conwy and south to Blaenau Ffestiniog. The railway arrived in 1868 from Llandudno Junction and brought with it more permanent residents who set up home here. Initially the line was used for the transportation of slate, but as more and more interest was shown in tourism carriages were made available for visitors and their families. Even today the rail journey down the Conwy Valley is considered to be one of the ‘classic’ train journeys of Wales. Despite all the Victorian tourist interest and the expansion of the climbing and walking world after The Second World War, the village still only has in the region of 600 permanent residents today. However, despite The Victorians opening the area up the history of this charming village goes back much further than this with the original settlement growing around a monastery in the 6th Century. Down the centuries lead mining in the surrounding hills led to more affluence and people coming to the area (if only for brief periods) to work. Betws-y-Coed has a lovely village green on the west side of The A5 close to the railway station (which now has a museum and a miniature railway, shop and restaurant) and the main street has a good selection of shops, inns, hotels, bed and breakfast establishments and cafés. Also on Holyhead Road you will find St. Mary’s Church which was built on the site of a former cockpit and fairground. Although it looks quite old it only dates from 1873. The oldest Church in (and one of the oldest in Wales) is The Church of St. Michael’s which is outside the village near the golf club and alongside the River Cowny. The Gwydyr Forest surrounds the village and has some lovely walking and mountain biking trails many of which are very challenging. One of the most popular strolls is to walk from the village alongside The Afon Llugwy to visit Miners Bridge. A circuit can be made by following the rivers flood alternative path higher up in the forest and then by using a descending lane back to Betws. For walkers and climbers Betws-y-Coed is something of a Holy Grail. Many travel north up the A5 from Midland destinations and lots more head down the A470 after using the A55 to come from Liverpool or Manchester or towns in Cheshire. After the long drive, and with the anticipation of a day on the hills ahead, the village really does feel like ‘The Gateway to Snowdonia’ and if it’s still early enough a stop will be made for a breakfast bap or perhaps some climbing or walking gear that’s been forgotten. As the morning progresses the tourists and coaches arrive and bring colour and humour to the streets. On a warm summers day it can feel very busy here but everyone is good natured and just out to enjoy the setting. And as the afternoon wears on the mountain bikers, walkers and climbers appear again often looking for a meal or to stay over in hotels or B&B’s before heading out to the hills again the next day. There are decent camping sites around too and for those not wanting to camp remotely (in Ogwen or near Pen-y-Pass) there is the opportunity to pitch a tent and walk into the pub for the evening. 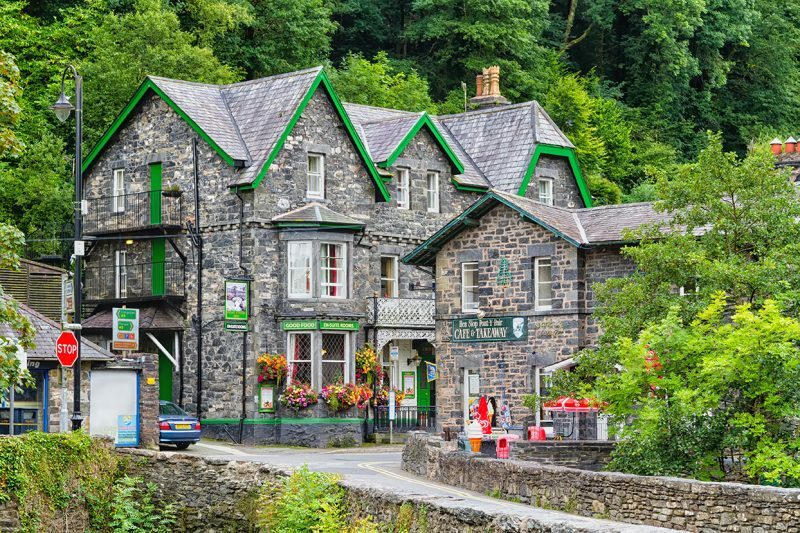 Betws-Y-Coed is all things to all people – from the happy holidaymaking families just wanting to see it, through the motor bikers who love to stop for a break and coffee and right up to the outdoor enthusiasts who have long called the village a second home. It’s worth visiting at any season of the year and most who come here were usually brought by their parents and now bring their own kids to show them around. It’s just that sort of place!